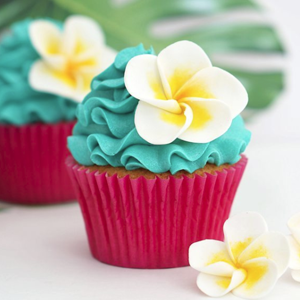 One of my favourite things is finding new piping tips to use when piping my cupcakes, as I think the perfect nozzle can transform your buttercream into something beautiful. 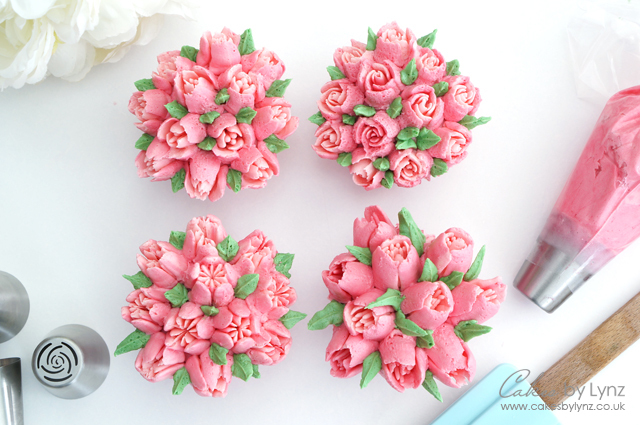 The Russian piping tips are a great way to pipe flowers and decorative designs very easily (although I have found a lot of practice and patience is required). 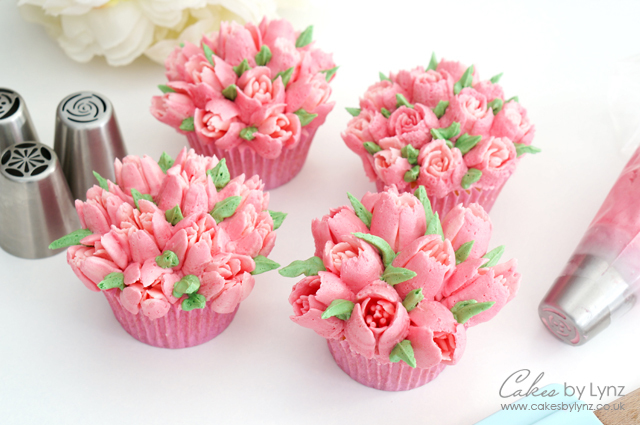 I have chosen my four favourite piping tips from the Russian piping sets which I think give the prettiest flower designs. Out of the four, three of them give a very similar effect to a tulip, but with some subtle variations, and the fourth creates a really pretty rose design. In this weeks video tutorial I have teamed these with the WIlton 352 piping tip to finish them off with little green leaves. I think by adding the leaves it really brings the cupcakes to life and makes them look more realistic. 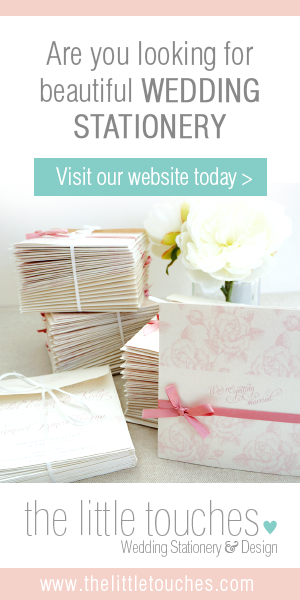 It also allows you to fill all the gaps between the individual flowers. For the buttercream I used my normal buttercream recipe, but made sure I mixed it in the mixer for 5 minutes to make it really creamy. 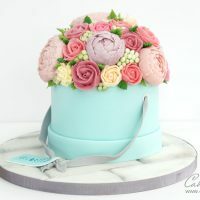 The trouble with these piping tips is the buttercream needs to be soft enough to squeeze easily out of the piping bag, but firm enough for the flowers to hold there shape, as in the tulips case the flowers can be quite high. I find that as soon as the buttercream you are trying to pipe has become too warm the flowers just won’t hold. 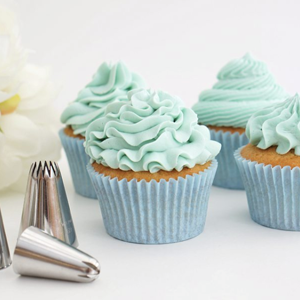 A tip is to put small amounts of the buttercream in the piping bag at a time so that it is not warmed up by your hands. You may also need a tiny spatula or knife just to push the tips of the flowers into position if they look like they are flopping. For the buttercream in the video I have used my favourite Wilton rose colour gel to colour 2 different shades of pink. I also used the Sugarflair extra foliage green, mixed with a little of the Wilton green to create the colour for the leaves. I really hope you enjoy this video tutorial and find it helpful if you are looking to pipe your own flower cupcakes with the Russian piping tips. 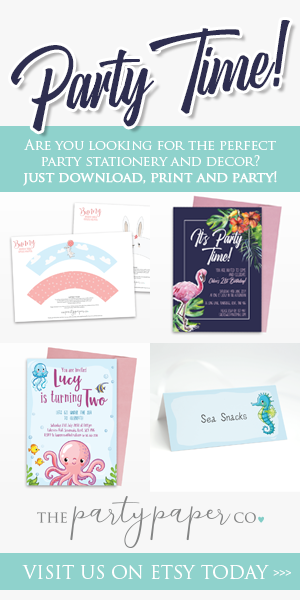 You make lovely cakes and decorations. I just wanted to know where do you get piping bags and nozzles? You make lovely cakes and decorations. 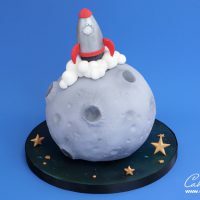 Can you tell me where do u get the piping bags and nozzles? 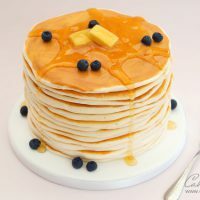 Lynz, I am so happy and excited that I discovered your blog as well as your videos on piping techniques! 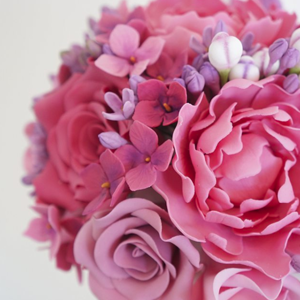 I can now feel confident decorating my cupcakes in a variety of beautiful flowers that I’m sure everyone will love! Thank you so much for sharing your special skills! Hi Dottie, Thank you so much. 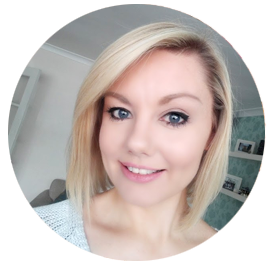 I am so glad you like my videos and blog. The russian piping tips are so much fun and I am really glad the video was useful.